Hello! And welcome to our first special event here at MVRE! We thought about doing a two game event featuring Automobilista followed by good old rFactor 1. 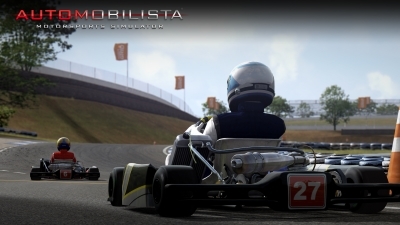 In Automobilista we will run some Karts around a small track (All stock content). The session will be one hour long including a small practice session followed by a qualifying and of course timed races. 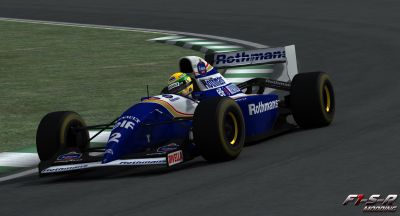 After that we switch over to rFactor 1 using the F1SR F1 1994 League Edition Mod ( Link Mod / Link Trackpack ). We will also run a small practice here followed by qualifying and a timed race. So we should have fun for about 2 hours and have some nice racing in two games with two totally different series. 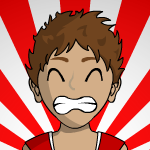 Ask any questions or suggestions here! We are still thinking about what track to run the 94's at ... might be Imola though. "94's at imola" Are you TRYING to get one of us killed? If we run spain then we get fucked by chicanes. If we run Monaco there'll just be death. Adelaide everyone will either be 3000 seconds off the pace or just hate it. 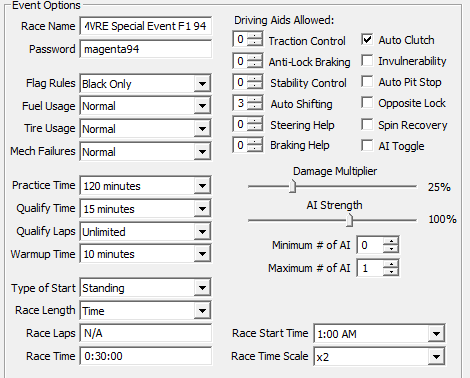 Server settings for the rF1 server added! Server settings for the ams server added! Sadly the kart server only has 16 slots because of the mod restriction (I might find a way around that without creating a seperate mod). 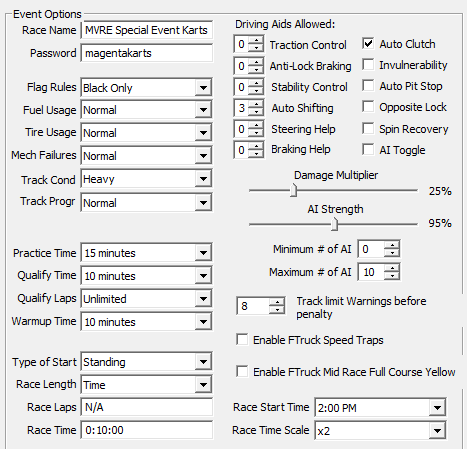 Also we are most likely to use shifter karts or something rather not too quick. For the F1 server the playerlimit will be at like 30~ so don't worry about not being able to race these. I hope many people turn up for this since one week after this event our F3 championship starts! Kart Server is online! Check out Speedland! F1 1994 Server will be online after another league event on saturday is done! F1 1994 Server online on Adelaide. The karting event was awesome! Never done these before for some reason I had huge problems with the 94 mod which I never had in the years I've raced it. So I was pretty frustrated with it . Thanks to everyone for showing up and I hope you found interested for the F3s in AMS or anything else!